I love the ease of making chia pudding – you can blend for a smoother texture, as the bits aren’t to everyone’s taste. 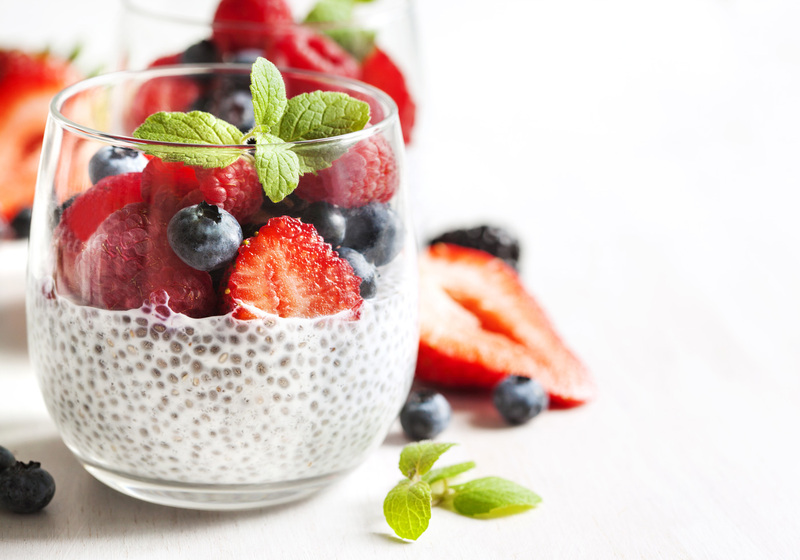 Chia is rich in calcium and essential fats, and serves as a breakfast, snack or dessert option. You can make it with lots of flavours, there are some ideas below. Some of the recipes are my own invention, others are from the wellnessmama site. • Chai: Add 1 teaspoon ground cinnamon powder and a pinch of cardamon and cloves for a chai flavour. • PB&J: Add 3 Tablespoons each of natural Peanut or Almond butter and Jelly or Jam of choice. Blend into recipe if using blended version. For whole chia seed variation, blend the peanut butter and jelly into the milk before mixing in the seeds. • Pecan Pie: Add 1/2 teaspoon of ground cinnamon powder to the base recipe and an optional 1/2 teaspoon of almond extract. Mix 1/2 cup of chopped toasted pecans into the finished pudding. 1 For Blended/Smooth Version: Place all ingredients in blender and blend on high for 1-2 minutes until completely smooth. 2 For Whole Chia Seed Version: Blend any ingredients if needed, except chia seeds in a blender until smooth (including any added flavors, fruits or chocolate). Alternatively just mix in a bowl by hand, then whisk in the chia seeds. 3 Pour mixture into a jar or glass container and place in the refrigerator for at least 4 hours or overnight to let gel.